STOKE’S meeting against local rivals Cradley Heathens in the National Trophy was abandoned after 10 heats due to rain making track conditions rideable but not raceable and referee Stuart Wilson after consultation with both team captains and managers calling a halt of proceedings, but the result stands with the Potters losing 22-37 at Loomer Road. The A.R. 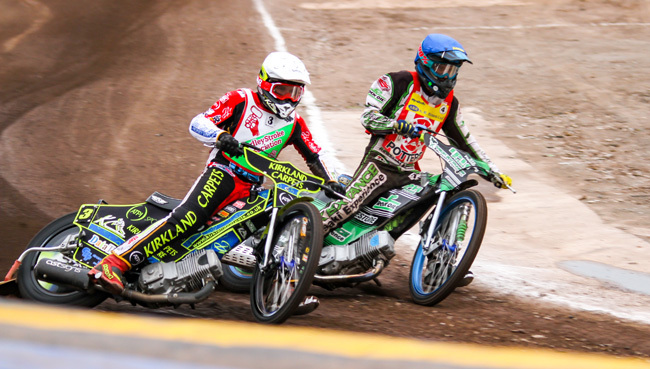 Richards Potters poor form continued though despite a bright start as Stoke number 1 Max Clegg took a comfortable victory over opposing Heathens number 1 Adam Roynon with Paul Burnett third as the Potters took the lead, Clegg recording the fastest time of the season so far of 63.6. The Heathens then took control of the meeting gaining a 5-0 in the next race as firstly William O’Keefe fell and then Joe Alcock fell resulting in the race being stopped giving Drew Kemp and Jason Edwards a great start to their evening. A further 5-1 from Kyle Bickley and Roberts in heat four gave the Black Country outfit a 15-8 lead. Kemp then produced the ride of the night as he held off Clegg with the Potters rider all over the Heathens reserve in the final couple of laps. With rain starting to fall steadily the Heathens pushed on gaining a 5-1 in heat seven. The Potters lost Rob Shuttleworth in the first running of the race as Bickley and Shuttleworth came together with the Stoke rider hitting the air fence hard resulting in Shuttleworth complaining of some pain in his neck area. All four riders were put back in but Shuttleworth was replaced by O’Keefe resulting in Edwards who was replacing Bradley Andrews who had suffered concussion and Bickley powering home with Alcock third. The Heathens took another maximum 5-1 advantage in heat nine before Clegg took victory in the final race from Bickley and Edwards. STOKE 22: Max Clegg 8, Tony Atkin 5, Paul Burnett 3+2, William O’Keefe 3, Adam Extance 2+1, Joe Alcock 1 Rob Shuttleworth 0. CRADLEY 37: Jason Edwards 11+3, Kyle Bickley 10+1, Drew Kemp 9, Adam Roynon 7+1, Conor Dwyer 0, Bradley Andrews 0, Jordan Jenkins r/r.